Great news! I have recently been appointed to the joint committee of street performers (otherwise known as “Des Amuseurs Publics” here) in Montreal. At a recent city council meeting, the artists themselves select 2 appointees for circle show performers, and 3 for musicians. Let’s be clear, all I had to do was show up to the council meeting and volunteer for the position, but, still, YAY. I am now officially a street rat advocate! Our job is to communicate with the city counsel when people need to resolve busking community issues. It’s been very difficult for me to understand this system & it’s recently changed again, so I am happy to be helpful for anyone coming into the city to try to explain the way things work. This city’s bureaucratic system is definitely broken in every way, and the busker permit is no different! To be a busker in Montreal, you need to obtain a permit from La Ville Marie on the 17th floor at 800 rue Maisonneuve est. They have recently gotten rid of the audition system, so you can now apply all year long. The license itself costs $160 to renew, and an extra $50 just to open a file if you are new. This is definitely the most expensive busking license in Canada! To obtain a permit, you must prove to the administration that you are worthy of being a street performer. You can do this by a) be a card carrying member of a professional association b) show that you have a education in the arts c) have another busker who already works on the pitch vouch for you. That’s what I am now at liberty to do so, feel free to contact me if you need someone to vouch for you! The permit allows you to perform most of the city, with exceptions. 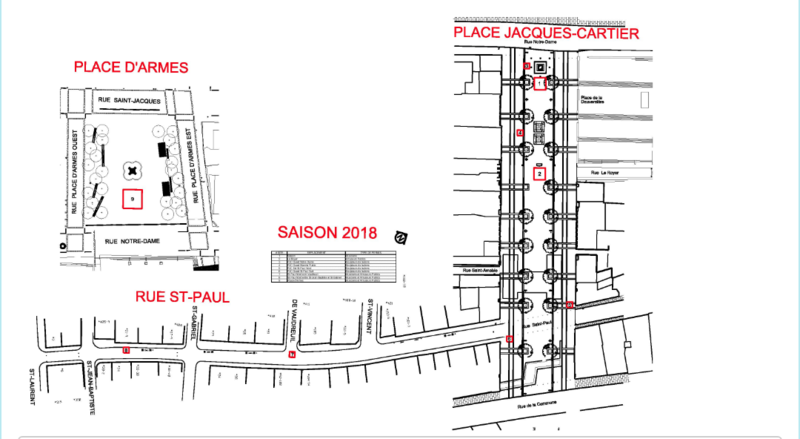 Street Performers don’t have the right to perform in the Quartier des Spectacles during the summer (May 15 – September 30), or at any of the street festivals that are happening in all the little neighbourhoods. You must contact the individual business associations (Société de Développement) or event organizers and they will either tell you that you can perform without a permit, or that they will give you a pass & performance times to perform in their festival. In the old Montreal, and specifically, Place Jacques Cartier & rue St. Paul, is where you will find the circle show and magic buskers. For this area there is an online draw that you have to register for with your permit at MapVilleMarie. The draw for the weekend takes place on Wednesday, and the draw for the weekdays takes place on Sunday. For us circus performers, there are 4 possible places to work in this little tourist area – 2 small pitches for magicians, statues or musicians (without amplification), and 2 large pitches, with amplification for big circle shows. There are also 3 spots for musicians and balloon twisters, but we’re focused on the performers for now! This is where it gets extra tricky! The circle show buskers who work the one large circle pitch in the middle of the square don’t follow these rules! They have separated from the city pitch by fighting for their rights, and they do a basic draw at 12:30 in a park next to the pitch called Place de la Dauversière. After that draw, you are free to show up to queue for a spot. There you have it folks! All the information you need to start performing in Montreal as a “amuseur des publics!”. If you are a musician, there are different rules but you can find other blogs about that. Wow Dawn, thanks for this. I’ll tag you in a post I made about some difficulties Buskers are experiencing in England. Good for you Dawn, making it happen! This is really helpful. The map isn’t clear where buskers can and cannot go. Do we have to remain by the music symbol in the subway stations? Can we randomly pick a spot in a park or on the sidewalk outside of festivals and old Montreal? Outside of the old port & subway, you are free to choose wherever you want – as long as you aren’t in another festival. You need permission to busk in a festival that’s already there. I am a 65-year-old public school teacher soon to be retired and I am also a tap dancer with three years experience. I would like to dance in the Metro as a busker mainly as a means to have a place to practice without disturbing my neighbors. I am just getting to the point where I feel I might have something that people would find entertaining. I would appreciate any advice you might have to offer for someone who is just getting started. Here is a short video of me shuffling my feet for a bit with a friend who was my teacher. We had been dancing for forty-five minutes and he just wanted to video a few seconds at the end. I am on the left. Hello! Sorry I hadn’t responded sooner. What type of advice are you looking for? I am interested in busking in Montreal. I am a 65-year-old tap dancer and I plan to start sometime in the next two years after I retire. Any advice you could offer would be appreciated. I am including a short video of myself dancing a year ago with one of my teachers. I take three to six classes per week as well as practice time and I have improved a lot since the video was made.